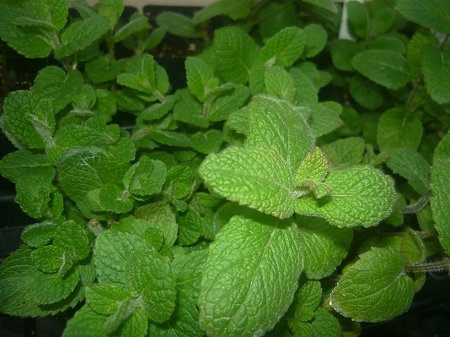 Wrigley's Spearmint (Mentha spicata 'Wrigley's)- Hard to find culinary and tea mint with a delightful spearmint flavor. Unusual mint with fuzzy rounded leaves similar in appearance to apple mint. Pale lavender flowers when in bloom. Easy to grow perennial in zones 4-9. Live plant in 3 inch container.